Ilya Gouliev was born in Moscow, Russia on 11th July 1955 in the family of a diplomat. At the age of 10 he started training sambo in Moscow and won 3rd place at the Moscow Junior Sambo Championships at the age of 14. In 1968 his father was appointed First Secretary of the Soviet Embassy in Rio-de-Janeiro, Brazil's former Capital. Ilya went to Brazil with his family and started training judo and kendo at Kobu-Kan Club in Rio and soon graded 3rd kyu in judo. In 1969 Ilya started training Shotokan karate under the Club's Chief Instructor Y. Tanaka — a graduate of the famous Takushoku University and of the first JKA Instructors' Course. In 1972 Ilya continued training in Brasilia under JKA Instructor T. Higashino and progressed up to Shodan JKA. In 1977 Ilya graduated from the Moscow State University of Foreign Affairs with a degree in international public law. As a university student he competed at different karate, sambo and judo tournaments. At that time karate was practically unknown in the USSR. Ilya became one of the very few Russians who had a chance to learn Karate abroad and under Japaneese Instructors. So at a young age of 18 he started popularizing and promoting Karate — first by teaching university mates in Moscow and then by organising clubs and tournaments in other cities of Russia and in different Soviet Republics. In 1978-1984 he was Board Member and Shotokan Committee Head of the ever first All-USSR Karate Federation. Thus Ilya Gouliev actually became the founder of Shotokan in the Soviet Union. This fact was officially corroborated in 2010 when at the age off 55 he was awarded the Russian Order of Merit 'For Special Services in Martial Arts'. In 1982 Ilya Gouliev also graduated from the Soviet Higher Diplomatic Academy with a degree in international relations and diplomatic protocol. He then worked for the Soviet Foreign Office until 1989. In 1993 he became Co-Founder and Vice-President of the Moscow Sport Law Association. In 1989 Ilya Gouliev was elected President of the Soviet Association of Martial Arts (SAMA) — the first USSR Federation to join EKU and WUKO. At the same time he continued training under Sensei T. Kaze and promoting Shotokan in his own country. In 1993 SAMA joined ESKA and WSKA and in 1993 it became a member of JKA WF and JKA WF Europe. Since that year Shotokan karate became Ilya Gouliev's full-time job. From 1991 Ilya trained under Sensei K. Enoeda and progressed up to 5th Dan JKA. He invited Sensei Enoeda to Russia twice every year for Technical Courses and Dan Grading. 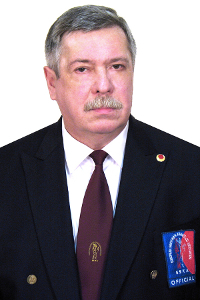 In 1995 Ilya Gouliev founded the Union of Shotokan Karate-do Organizations and of Russia (USKO Russia), Sensei Enoeda its Chief Technical Advisor. USKO Russia became SAMA's assignee in all the international Shotokan karate bodies. After Sensei Enoeda passed away in 2003, Ilya continued to work with Sensei H. Ochi who is at present Chief Technical Advisor of USKO Russia. In 1997 Ilya graded 6th Dan World Karate Confederation. In 2001 Ilya Gouliev was elected Vice-President of the European Shotokan Karate-do Association. He considers ESKA to be the strongest Shotokan organization in Europe. Ilya Gouliev is President of USKO Russia which unites 44 Russian Regional Federations with a total of over 14 thousand karateka. In 2005 he was elected Highest Council Member of the Martial Arts Union of Russia which is Russia's Governing Body for all Martial Arts. Ilya Gouliev is the author of numerous articles and Russian TV films on Shotokan Karate and other martial arts.